Downtown is within close proximity to the area, approximately less than four kilometres south, creating desirability for infill home buyers and developers abroad. Mount Pleasant is situated between main routes that give access to plentiful amounts of amenities and services, while Confederation Park borders the north side of the community providing great leisure and recreation for residents. Mount Pleasant southern border happens to be the Trans-Canada Highway that provides or gives access to a vast amount of amenities and services. Travel west on 16th Avenue NW to reach innumerable strip malls, North Hill Mall, Home Depot, Banff Trail Business park, McMahon Stadium or even a bit further down and up Shaganappi Trail to Market Mall, all of which can be reached in fewer than ten minutes of driving. Travel east on 16th Avenue NW to reach even more strip malls, amenities and services or access Deerfoot Trail in under five minutes of driving. SAIT Polytechnic and Alberta College of Art and Design are situated across 16th Avenue NW and 10th Street NW intersection, giving students and residents alike the use of their facilities. Jubilee Auditorium is located on the same block as SAIT that hosts a ton of eventful performances by entertainment groups and musicians. Let’s not forget Confederation Park with its massive land area that has a public outdoor swimming pool, indoor and outdoor hockey rinks, and multiple sports and playing fields. Mount Pleasant is home to two French Immersion schools that include King George Bilingual Elementary School and Ecole de la Rose Suavage French Junior and Senior High School. For public students school designation for kindergarten to grade six are either Buchanan Elementary or Rosemont Elementary, of which Rosemont has a bus courier to deliver them to and from. Junior High designation is to Georges P. Vanier that tends grades seven to nine and for High School students they will either go to Crescent Heights High School or James Fowler High School. 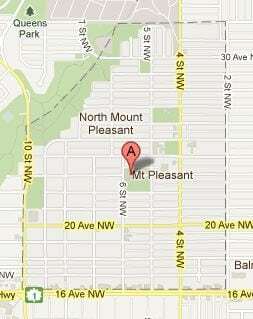 Mount Pleasant has great access public transportation. The closest LRT station is SAIT Station which is about 1.5 kilometres away from the central point of the community and is a short walk away. Some of the many bus routes that stop within or on the borders of Mount Pleasant include North Hill, Rosedale East Calgary, 16th Avenue North, Huntington, Northland, Elbow Drive and Sandstone, BRT North and West (dedicated LRT replacement), MacEwan Express, Panorama Express, Deerfoot Centre, Renfrew and Spruce Cliff, Lions Park, Dalhousie and Calgary South (South Centre Mall), and 14th Street Cross-town from North to South. Call me anytime for answers! Reach me directly at 403-370-4180. I am looking forward to helping you attain your real estate goals!